Savings on utility bills and better indoor air quality are just two of the benefits of radiant floor heat systems. The heat from a radiant floor creates warmth that “radiates” into everything it touches – including furniture and your feet – making everything feel warm and cozy. The radiant heat tubing for this project was laid 9″ apart, which will accommodate several heat source systems, including a heat pump for geo thermal or a boiler (electric or gas). You can also use the water jacket on a wood stove to heat the water in the tubing. The other advantage to having the tubing a little closer together is that there are no pronounced hot or cold spots in the floor. 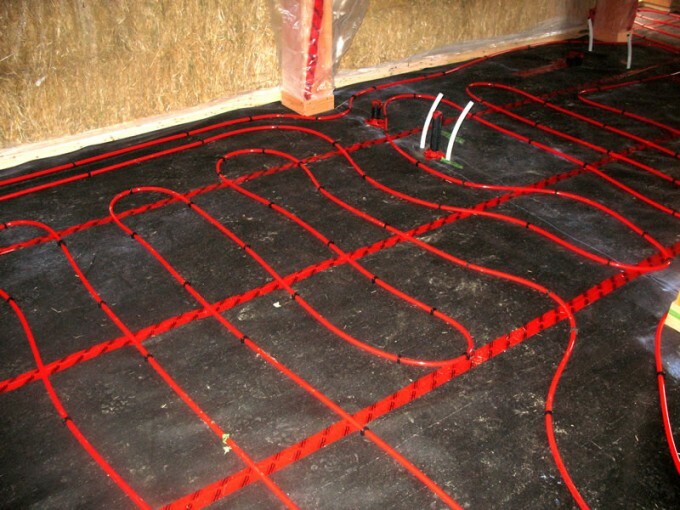 One thing to consider is that where the tubing enters the floor directly from the heat source, the floor there will be a bit hotter, so it’s best to plan this for an area that you would want hot anyway, such as a living area or bathroom. Don’t have these tubes enter the floor near a cold storage area or pantry that you want to stay quite cool.